Holly Jenson is the new student at Madison High and she’s never felt so uncomfortable in her life. She can’t figure out how to get her new classmates to like her. The senior class camping trip is coming up and she knows that Matt Ifft will be there. That would be awesome since she has a crush on him. She promises herself she’ll make the trip fun. But when the phones stop working and Tricia disappears, Holly knows something is terribly wrong. Then Rhonda disappears. There’s a killer among Holly’s classmates. But who is it? If Holly can find someone she can really trust maybe they can escape together…if they live long enough. I enjoyed Kelli Sue Landon’s first book Sudden Moves. I had no reason to believe I wouldn’t like this one. I was not disappointed. I have always like scary stories and this fit the bill. Holly has recently moved to Madison High because her father passed away. She doesn’t fit in very well. She is befriended by an even bigger outcast, Erin. The senior trip comes up and Holly encourages Erin to go with her on the campout. This is where the jealousy sets in. Holly talks with another girl, Mindy and Erin gets mad. Things go from bad to worse right from the beginning. 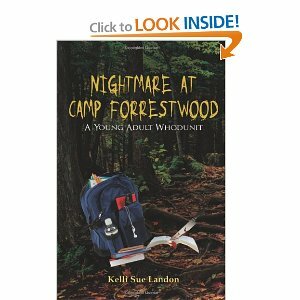 The first night a counselor and one of the girls go missing. Then the students and counselors start disappearing one after another. Holly, Matt, and Mindy must now try to figure out who the killer is and try to avoid being their next victim. One thing that made this such a tasty read was they set everything up with a rumor about a mentally challenged boy and a murder at the campground. This was a great book. I look forward to reading more by this author. The twists and turns she puts in her books will keep you coming back for more.